The Chandra X-ray Observatory has provided evidence that our Milky Way Galaxy is embedded in an enormous halo of hot gas with a radius of about 300,000 light years, although it may extend significantly further, and with a mass comparable to the mass of all the stars in the Milky Way Galaxy. Astronomers have used NASA’s Chandra X-ray Observatory to find evidence our Milky Way Galaxy is embedded in an enormous halo of hot gas that extends for hundreds of thousands of light years. The estimated mass of the halo is comparable to the mass of all the stars in the galaxy. If the size and mass of this gas halo is confirmed, it also could be an explanation for what is known as the “missing baryon” problem for the galaxy. Baryons are particles, such as protons and neutrons, that make up more than 99.9 percent of the mass of atoms found in the cosmos. Measurements of extremely distant gas halos and galaxies indicate the baryonic matter present when the universe was only a few billion years old represented about one-sixth the mass and density of the existing unobservable, or dark, matter. In the current epoch, about 10 billion years later, a census of the baryons present in stars and gas in our galaxy and nearby galaxies shows at least half the baryons are unaccounted for. In a recent study, a team of five astronomers used data from Chandra, the European Space Agency’s XMM-Newton space observatory and Japan’s Suzaku satellite to set limits on the temperature, extent and mass of the hot gas halo. Chandra observed eight bright X-ray sources located far beyond the galaxy at distances of hundreds of millions of light-years. The data revealed X-rays from these distant sources are absorbed selectively by oxygen ions in the vicinity of the galaxy. The scientists determined the temperature of the absorbing halo is between 1 million and 2.5 million kelvins, or a few hundred times hotter than the surface of the sun. 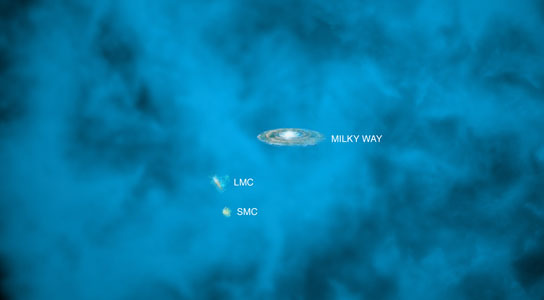 Other studies have shown that the Milky Way and other galaxies are embedded in warm gas with temperatures between 100,000 and 1 million kelvins. Studies have indicated the presence of a hotter gas with a temperature greater than 1 million kelvins. 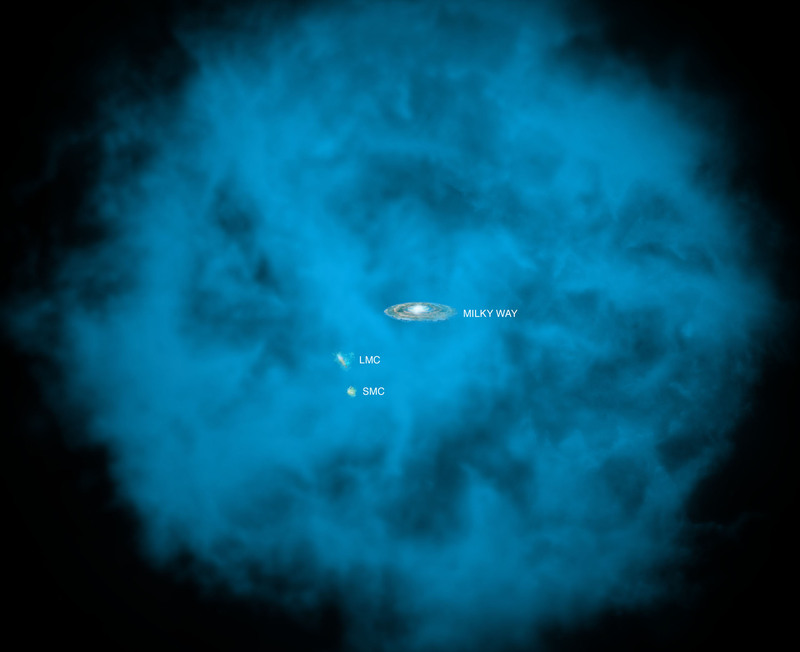 This new research provides evidence the hot gas halo enveloping the Milky Way is much more massive than the warm gas halo. To begin to answer this question, the authors supplemented Chandra data on the amount of absorption produced by the oxygen ions with XMM-Newton and Suzaku data on the X-rays emitted by the gas halo. They concluded that the mass of the gas is equivalent to the mass in more than 10 billion suns, perhaps as large as 60 billion suns. The estimated mass depends on factors such as the amount of oxygen relative to hydrogen, which is the dominant element in the gas. Nevertheless, the estimation represents an important step in solving the case of the missing baryons, a mystery that has puzzled astronomers for more than a decade. Although there are uncertainties, the work by Gupta and colleagues provides the best evidence yet that the galaxy’s missing baryons have been hiding in a halo of million-kelvin gas that envelopes the galaxy. The estimated density of this halo is so low that similar halos around other galaxies would have escaped detection. The paper describing these results was published in the Sept. 1 issue of The Astrophysical Journal Letters. Other co-authors were Yair Krongold of Universidad Nacional Autonoma de Mexico in Mexico City; Fabrizio Nicastro of Harvard-Smithsonian Center for Astrophysics in Cambridge, Mass. ; and Massimiliano Galeazzi of University of Miami in Coral Gables, Fla.
NASA’s Marshall Space Flight Center in Huntsville, Ala., manages the Chandra program for NASA’s Science Mission Directorate in Washington. The Smithsonian Astrophysical Observatory controls Chandra’s science and flight operations from Cambridge. Be the first to comment on "Chandra Shows Halo of Hot Gas Surrounding the Milky Way"